This is a late 19th century silk half mourning dress. It is a great study piece. Half mourning was worn after the first year of mourning. Colors were in the lavender and grey family. 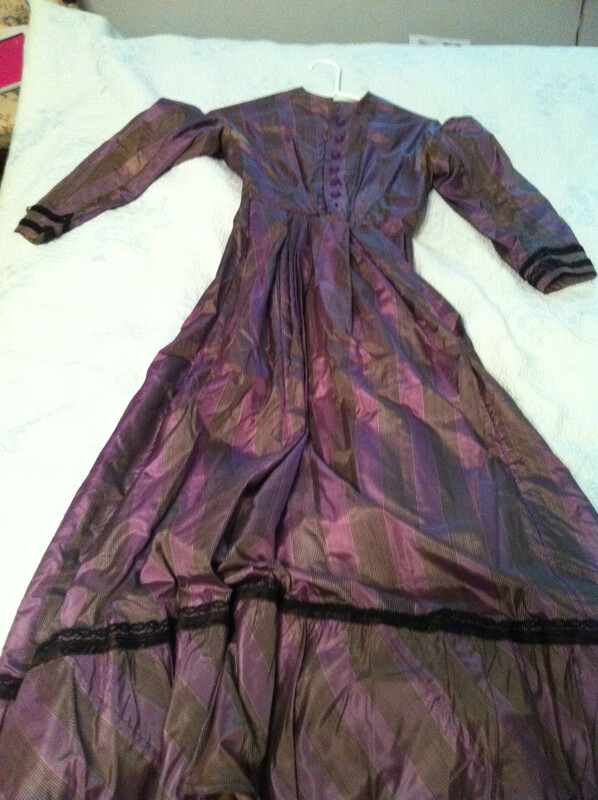 This is a beautiful silk dress with pale grey and black stripes on a lovely lavender background. It is lined and has lavender silk covered buttons.The sleeves are edged in two rows of black lace,.The skirt is flounced at the bottom. Bought at a local southern estate sale. I love it but I can't keep everything. The condition is fair-there are a couple of small holes at the top of the bodice and some discoloration(lightening of the fabric) near the arms. The lining is intact. It is really a lovely dress and I am certain it was hand made. Please don't hesitea to ask any questions. International buyers will be charged for shipping to their country of origin,determined after the sale. Thanks for your bid and please don't hesitate to ask any questions! A: The dress is about 49 inchs in length. From the shoulders to the end of the sleave ves,it measures about 24 inchs. Around the waist is about 19 inchs. If I was guessing I would call it a modern size 4. There are some holes(small about 2) at the very top of the bodice and a small tear in one of the top sleves. The dress is lined with some heavy brownish material I dont know the name of. Sort of a stiffening type fabric that is brown and has some age foxing,like an old book.No smells or musty oders.Some boning in the lining of the dress around the waist. beautiful fabric very consistent with "seond mourning" clothes. Self covered buttons one missing.Found "in the wild" at an estate sale of two spinster sisters who died in their 90's. I am guessing this dress may have been their mother's. Anyway, today is purple day! Yay!